Here are some shots taken by Mick during a mini NEAG meeting in my kitchen last Saturday. David Long came over and joined Stephen Harrold, Mick and myself for a chinwag about DCC and for David to have a good poke about on the nether regions of 'Niddbeck Bridge'. David brought along his Uhlenbrock chipped class 33 Farish diesel with scratchbuilt chassis. Slow running performance was impressive and will no doubt improve even more with a few CV tweaks. David also had a selection of photos of his new 60's/70's era diesel shunting layout which looks very impressive and not too far away from being exhibitable. One to watch out for. The pic below shows the newly installed curved backscene board on 'Niddbeck Bridge'. As previously described this is two thicknesses of 5mm foam-core board made bendy by lots of vertical knife cuts at 5mm or 10mm centres according to radius required. First one thickness was glued into place using PU gel wood adhesive (Bison TimberTix) and held temporarily with dressmakers pins. Once this had set the second lamination was added, PU'd and pinned in place, relieving cuts face to face. 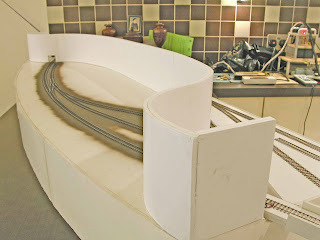 Once the glue had set it became a gratifyingly firm structure, acting as a central spine for the whole baseboard unit. The thickness of knife blade used also affects the 'bendability' factor of foam-core board - a thick Stanley knife blade allowing more flex than say a thin scalpel blade. The shots below shows the double-curve treatment used at each end. 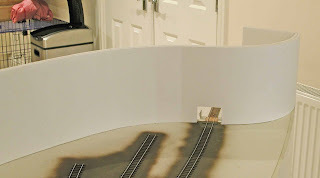 My intention is to try and make the layout appear scenically longer than it actually is, by wrapping the painted sky/landscape backscene round like fiddle yard like this, and by making the scenery taper off to next to nothing. 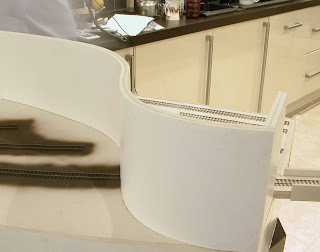 Tony has kindly offered to help with the scenic and buildings aspect of the layout, so I'm hoping he might assist with painting the backscene. I've long admired his understated effort on 'Masham'. I'm presently debating how to clad the exterior side and end edges of the layout. The foam-core board is very susceptible to scuffs and dents, especially when being carried single-handed through doors and loaded into cars etc, so some form of protective skin is going to be required. I think Tony used Fablon to cover 'Masham' ('sticky-back' plastic of Blue Peter fame - remember that?). My inclination is to use Formica or thin plywood. A start has been made on the station building, or at least the etched windows, doors and bay front that Bob did for me. The platform and cattle/horse dock are next up, or at least the edge bits, so I can then get on and ballast the track. The back of "Masham" was (and indeed still is) covered in sticky backed plastic as the formboard I used was ex-display material and covered in printing. The front is actually formed from a semi-blown vinyl material; quite robust and with a small amount of surface texture. I very much like the way the backscene on Nidd Bridge bends round to envelope the offscene sections; very nice indeed! This looks a very interesting idea for backscenes I shall watch your progress with interest. No doubt our esteemed editor would welcome an article in due course!